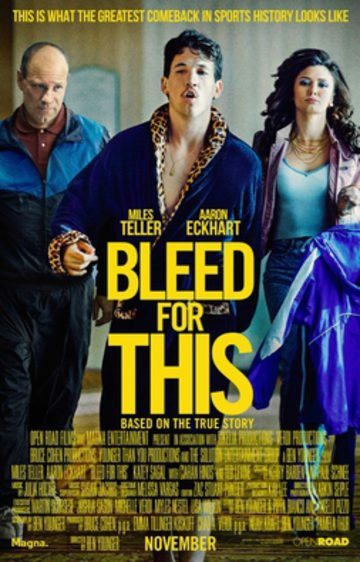 BLEED FOR THIS is the incredible true story of one of the most inspiring and unlikely comebacks in sports history. Miles Teller (Whiplash, Divergent) stars as Vinny “The Pazmanian Devil” Pazienza, a local Providence boxer who shot to stardom after winning two world title fights. After a near-fatal car accident leaves Vinny with a severed spine, he is told he may never walk again. Against all odds and doctor’s orders, renowned trainer Kevin Rooney (Aaron Eckhart) agrees to help Vinny return to the ring just a year after the accident for what could be the last fight of his life.